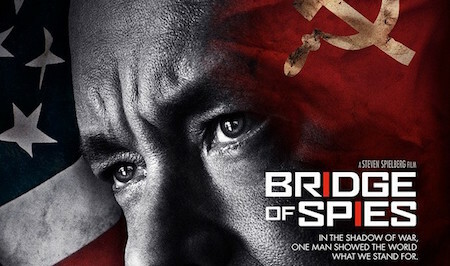 Tom Hanks re-teams with Steven Spielberg for this dramatic, factual Cold War drama. The year is 1957. The world is caught in the grip of the Cold War. James B. Donovan (Tom Hanks) is a noted American insurance lawyer who finds himself caught up in an international crisis when he's recruited by the CIA to defend incarcerated Soviet spy Rudolf Abel (Mark Rylance). The situation escalates when Donovan is sent to East Berlin to negotiate the release of American pilot Francis Gary Powers (Austin Stowell), whose spy aircraft was shot down over the Soviet Union, in exchange for Abel. Before long, the fate of the world comes to rest on the shoulders of this unassuming, all-American hero. The dream team of legendary Saving Private Ryan director Steven Spielberg and Forrest Gump star Tom Hanks promises to make this a gripping and involving look at a fascinating true story, one that plays out against the tense relationship between these two great superpowers.